Hey there, I’m Nathan Bone and I’ve just completed a four week internship at thinkWhere. My internship came about through an organisation called Career Ready, a UK charity that prepares young people, like myself, for work. I’d like to take you on my adventure from High School pupil to temporary Graduate Consultant at thinkWhere. When I was selected to be an intern as part of Career Ready, I wasn’t fully aware of how long the journey would be. I completed my application in October 2017 and was advised my placement would be with thinkWhere in November 2017. I met my mentor Alan Moore, thinkWhere’s Chief Executive, at a Career Ready Masterclass session at Stirling University. I was very nervous to meet Alan at first, but it turned out to be a very positive experience as I found out how nice Alan was and learned a bit more about thinkWhere as a company. I was surprised Alan and I had so much in common. Between November 2017 and June 2018, I visited the thinkWhere office, and to meet the staff I would be working with. This included Duncan, my thinkWhere supervisor who coordinated my work during the four weeks of my internship. 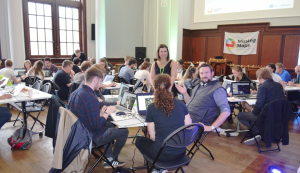 In early June, along with 50 local volunteers, I participated in a Missing Maps (Stirling) mapathon hosted by thinkWhere. Missing Maps is a global data capture project, which captures OpenStreetMap data for humanitarian purposes. The mapathon gave me my first taste of GIS. I discovered how it was used in the real-world, and began to understand how data captured helps vulnerable people across the globe. I really enjoyed the mapathon (which are run as regular events), so I’m hoping to attend the next one on September 18th. My first day at thinkWhere was on the 25th June 2018. At the time of writing this Blog, it seemed like it was last week but it was actually 4 weeks into my internship. Time really does fly when you’re a Graduate Consultant! Throughout my time at thinkWhere I attended a few meetings. These involved pretty much everyone in the office. It was mind-blowing to see thinkWhere products such as Location Centre and theMapCloud, not to mention leading OpenSource GIS technologies such as Postgres, GeoServer and QGIS. When I joined the company, I had little or no knowledge of any of the technologies used in a GIS company, but I did have a rough idea as I got a brief overview from when I visited in December. During my time, I attended thinkWhere’s FastTrack QGIS training course. I successfully created a map which impressed my supervisor and mentor. I also worked on a school project which I’d pitched to Alan and Duncan. 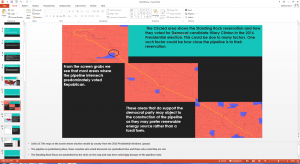 I was pretty bold and chose a fairly complex project – The Dakota Access Pipeline – a subject I have chosen as part of my Advanced Higher Geography, and worth a third of my total grade. I sourced the project data from the internet, and used the training I received in QGIS to analyse the information. I then created a variety of maps to back-up my statement and proposed a new route for the pipeline based on a number of constraints and considerations potentially impacting on the original route. I presented my project findings along with my summary of work experience to everyone at the thinkWhere monthly Meet and Eat. I was very nervous doing my presentation, but afterwards I felt really good. It was a positive experience, with a round of applause at the end that boosted my confidence. The team seemed to enjoy the presentation and appreciate the maps I had created. I thoroughly enjoyed every single moment of my thinkWhere internship and cannot thank the team enough. 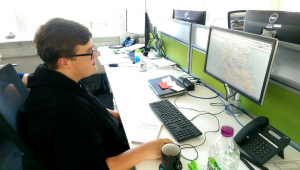 I have had great insight into a real GIS Consultancy working environment, and have been inspired by all the hard work the team puts into everything they do. Thank you thinkWhere for this opportunity. I wish you all the best for the future.